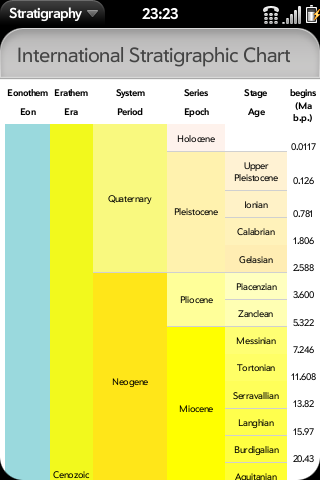 This is a geologic timescale, or to be more exact, the International Stratigraphic Chart (ISC, version of 2009). You can look up all formally defined stratigraphic units, the time (million years before now) they have begun, whether they've defined by a “Global Boundary Stratotype Section and Point” (GSSP), and their “official” RGB colour codes. For some units, there's a bit of additional geologic and paleontologic information. Currently, the app interface is in English or German. The names and additional information are not translated (yet). The app is still work in progress, any corrections, translations and suggestions for improvements are welcome.